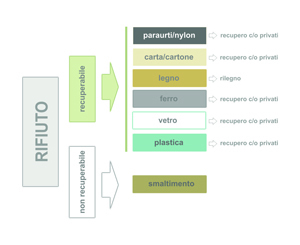 Vidori Servizi Ambientali SpA’s current Authorization allows the company to store/treat up to 250 000 tons of waste/year and handle the widest range of EWC codes, both hazardous and non- hazardous. The origin of the waste is 60% from small and medium-sized companies and the rest from big national manufacturers. 3. reception office and customer service. Vidori Servizi Ambientali SpA operates mainly in its own plant with a “turn-key” philosophy therefore offering a complete waste management service, from consultancy, to assistance, to characterization, to collection with transport, up to final disposal/recovery of all types of waste.